Heinz Beck has the distinction of being the only chef in Rome to hold three Michelin stars with his restaurant La Pergola at the Rome Cavalieri Hilton. And Apsleys, at the Lanesborough Hotel on Hyde Park Corner, is the London offshoot of this internationally acclaimed, German-born, Italian-based chef. Apsleys opened about two years ago, and this year, it received Michelin acclaim when it earned its first star in January. As befits a restaurant that is housed in a St Regis hotel, the Apsleys dining room is a statement in jaw-dropping art deco elegance. It exudes luxury, with three massive chandeliers holding centre stage as they dazzle in front of your eyes. The interior designer was none other than Adam Tihany, the internationally renowned restaurant and hotel designer. Pierre Gagnaire’s Sketch counts as one of his designs, and notable upcoming projects include the redesign of the Mandarin Oriental in Hyde Park which will feature the new Heston Blumenthal restaurant which will open this autumn. Being an Italian restaurant, there are the usual antipasti, zuppe e primi and secondi courses on the menu. There is also a five course (£59; with matching wines – £89) and a seven course (£79; with matching wines – £119) tasting menu. The five course tasting is based on the seven course menu, but with no lobster starter and a choice between the sea bream and the venison courses rather than both. We selected the five course menu which kicked off with a ‘Chef’s Surprise’ amuse bouche of an arancini (a rice ball coated with breadcrumbs which originates from Sicily), and a sweet pepper and courgette terrine. The arancini, which tasted like a deep fried risotto, was pleasant but unspectactular. The terrine was filled with natural sweetness and had a lovely soft texture. 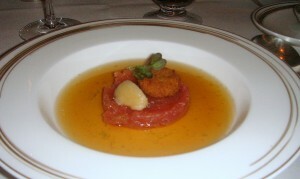 The first course was a dish of herbal infusion with tuna tartare and green tea sorbet. The infusion was rich with herby flavours, and the tuna was lovely and delicate. But being so light, the combination of the two proved to be unremarkable. The warm infusion also had the effect of raising the temperature of the tartare slightly which I didn’t enjoy. The sorbet had a slightly bitter aftertaste and did not complement the tuna. 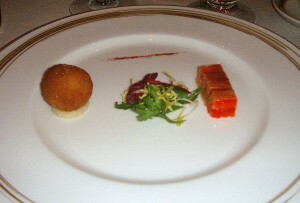 There was also a potato croquette which seemed superfluous to the dish. Individually, each aspect of the dish was nicely done, but as a whole, it failed to wow. This was an example of a dish that I just didn’t ‘get’. 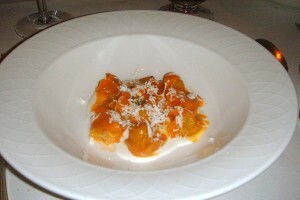 Red tortellini with aubergine and smoked ricotta came with a lovely ricotta sauce. However, the pasta was slightly overcooked, leaving it a little soft and surprisingly not al dente. A carpaccio of scallops was exquisitely juicy and sweet. It was served with a creamy pea puree which worked wonderfully well with the scallops. 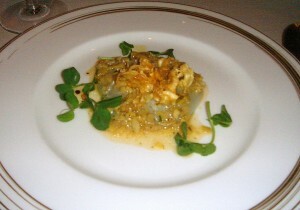 However, it was finished with an artichoke vinaigrette which overpowered the delicate sweetness of the scallops. My companion LD can’t eat scallops, so she opted for the wild sea bream dish instead. 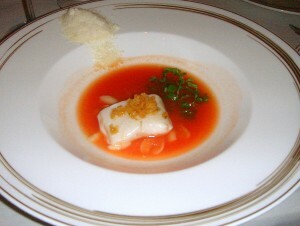 The fish was soft and flavoursome, and worked well with the accompanying cannellini beans and the beautiful, clear tomato coulis. There was also a drizzling of ‘cod snow’ – shavings of dried cod – which, with its intense cod flavour really packed a punch. We both had the venison which was delectably tender. It had been rolled in a fine coating of amaretti biscuit crumbs which added a nice touch of sweetness to the meat. 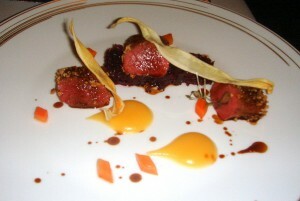 The sweet and acidic nature of the accompanying red cabbage worked well with the venison, and the various garnishes of parsnip crisps and apple puree were nicely done. (A small point, but both our servings had been plated differently. For instance, there were different quantities of cabbage on our plates. And I thought consistency was important in a Michelin restaurant?!). Pre-dessert produced the ‘wow’ factor in the form of a coconut cream with passion fruit jam and lime meringue. This was really lovely, with the sharpness of the passion fruit marrying beautifully with the creaminess of the coconut and fluffiness of the meringue. There was also a piece of passion fruit jelly. The final course was an excellent ‘cremoso’, a chocolate, hazelnut and coffee cream dessert on a base of thin chocolate brownie. It was accompanied by a muscovado ice cream and some coffee crumble and coffee granite. Rich and decadent, there were lots of lovely flavours and textures oozing forth, from the chocolate to the coffee. 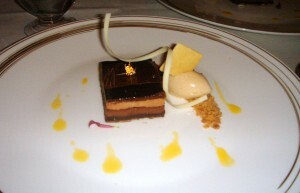 Again, both our desserts had been plated differently, with our two slices of cremoso being different sizes. There was no doubting the good technique at Apsleys, and it’s perhaps understandable why the restaurant has a one star. The coconut cream pre-dessert and the cremoso were excellent, and the sea bream and the venison were quite delicious, but there were also some flavour combinations which didn’t quite gel. The herbal infusion with the tuna felt dull, and the strength of the artichoke jarred the finesse of the scallops. Also, it was disappointing to see the tortellini being overcooked, not to mention the inconsistencies in the plating of the venison and dessert courses. Overall, the food, whilst accomplished, was hard get excited about it. I just found it a little lacklustre and soulless. Service was reasonably polished, but at times it felt a bit intrusive with perhaps too much attention from the waiting staff. Excluding the menu options with caviar, 3 courses from the a à la carte menu will set you back between £56 and £80. The restaurant doesn’t come cheap, and given that the food didn’t dazzle as much as the chandeliers, I am not sure that this is my first choice for fine dining in London. Totally agree with you. Frankly, Zafferano has better italian food. totally wrong, Apsleys is one of the top london restaurant….. if we consider it Italian, this is the best in London. Great tecnics, amazing pasta and top quality dessert. Zafferabo and Locatelli it’s nice but Trattoria level, no Michelin standard.